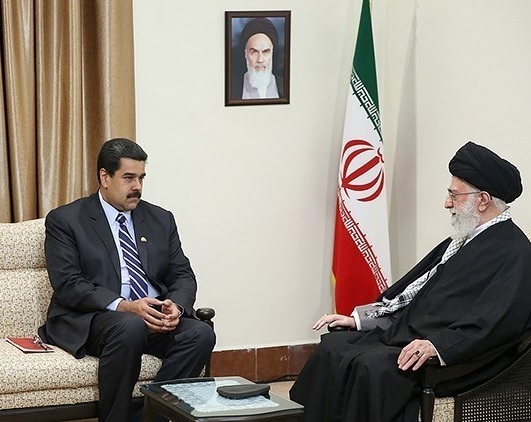 Venezuelan Socialist tyrant Nicolas Maduro with Ayatollah Ali Khamenei in Iran. Sources inside Iran say the Khomeiniist regime is sending top IRBC Commanders to Venezuela to quash the popular democratic uprising. Iran already has military forces spread out to Syria, Yemen and Lebanon. This is a frightening development. Tehran’s provocative actions are already raising serious concerns among analysts. So said Iranian president Hassan Rouhani on January 1, 2018, four days after nationwide protests began to consume his country. “Our great nation,” he declared, “has witnessed a number of similar incidents in the past and has comfortably dealt with them. Foreign countries and governments that are at odds with the U.S. government will stop at nothing to influence elections. In announcements made on January 31, Facebook and Twitter stated that several hundred pages and accounts linked to Iran, Russia, and Venezuela had been taken down. These pages advocated for decidedly anti-West values, especially pro-Palestine propaganda and 9/11 conspiracy theories. On Twitter, Iranian accounts were targeting U.S. midterm elections in 2018. A majority of these accounts were suspended before the election. Over 2,617 accounts linked to Iran were suspended. Twitter was also forced to remove 764 accounts in Venezuela. Many of these accounts were linked to a foreign campaign that focused on “divisive campaigns.” While most of the accounts targeted Venezuelans, a few were aimed at other, unnamed audiences. Facebook later stated that it is investigating activity in Venezuela.